It was a beautiful day in the Florida Keys. A perfect day some would say. We agreed to set aside work and spend the day as a family, relaxing on the ocean. Except, we all like to do different things. He wants to fish. I like to sunbathe while gazing at the blue water. And our daughter likes to swim. All in different places, at different paces. So, what’s the solution? Who wins and who loses? Or, can there be a win-win? I suppose that depends on your definition of winning. On this day, I wanted my husband to enjoy fishing. Why? Because he spends the majority of his life prioritizing his wife and daughter. He was long overdue for some compromise. And, not just when you conveniently share beliefs, interests, and friends. The common ground between you and your partner is your relationship. 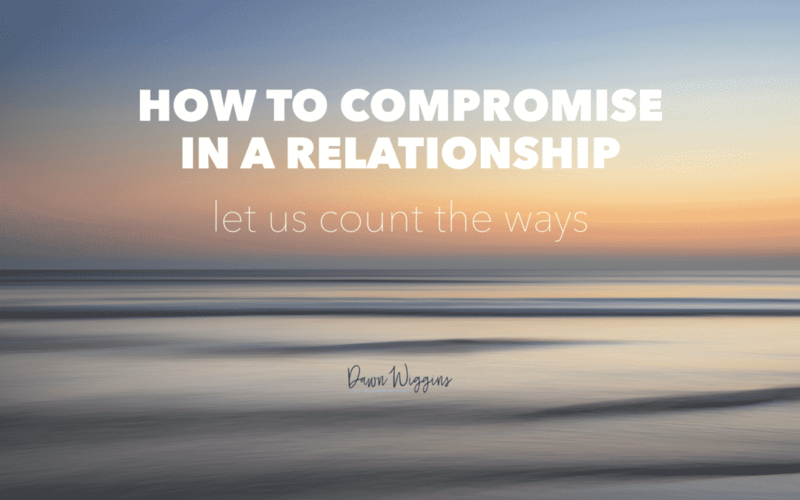 Once you understand that, it’s easier to understand how to compromise in a relationship. I don’t love fishing, but I love my husband and our relationship. Sometimes, that has to be prioritized over what I want. In fact, if you and your partner share all of the same interests and ideas, there is a larger red flag. A relationship with no differing opinions is usually boring and inauthentic. It’s not common to find two people who agree on everything. It’s important to celebrate the differences in your relationship. Too often we want to mold our partners to think and behave more like us. This is a form of rejecting who they are. Rejection hurts and eventually kills the love and warmth in a relationship. Think about the word curiosity. What comes to mind? For me, it’s a genuine exploration with a hint of excitement. If you approach your partner with curiosity, they will show you how to compromise in a relationship. Communicate a genuine desire to learn and a willingness to prioritize their feelings. Relationships with the most conflict typically lack an authentic willingness to hear and understand what each other is genuinely wanting or expressing. And, when we minimize each other’s thoughts and feelings, we lose faith in each other and the relationship. Back to my story about family boating. So, why go fishing as a family? Why not go separate ways so we can each do what we want? Notice how it feels to do things with your partner. Can you sense internal resistance to doing something you don’t prefer? Couples don’t need to do everything together. It is important to have some independence in a relationship. But when you don’t enjoy doing things with your partner, there is a red flag indicating you don’t know how to compromise in a relationship. As a family, we practice compromise and empathy. Compromise is an investment in your relationship. The more you practice, the more you receive in return. The more valued someone feels, the more they want to give back. I often see couples waiting for the other person to compromise. This is a relationship killer. Make compromise a habit, regardless of your partner’s choices. On family fishing day, I had the opportunity to learn a bit about fishing, which I enjoyed (to my surprise). And, my husband got to demonstrate his knowledge and skill. I cannot highlight the importance of this last part enough. Everyone likes to feel confident in themselves and admired as such. It’s an automatic relationship enhancer. Kids like to teach adults and show off their capability and knowledge. Employees want to educate their employers about overlooked issues within a company. And partners like to be seen as talented, interesting and valuable. The moment you show interest in the interests of a loved one, you are investing in that relationship. And you understand better how to compromise in a relationship so everybody can win. By the end of our day, we all won. Perhaps we all gave a little and received a lot. None of us went to sleep feeling unimportant or unfulfilled. If you find yourself in high conflict or unfulfilling relationships and don’t know how to compromise in a relationship, notice where you may need to ask for more interest OR offer more interest.